If you looked inside an Arduino Library you would see filename extensions such as .h and .cpp, which makes us conclude that the Arduino IDE uses C++ for its codes. If you look inside those files most of the Arduino Libraries have C++ classes inside of them. The question now is: Can you use C++ Classes in Arduino IDE without Creating a Library? It is a bit tricky though as there are rules you need to follow. I shall dive into that later. 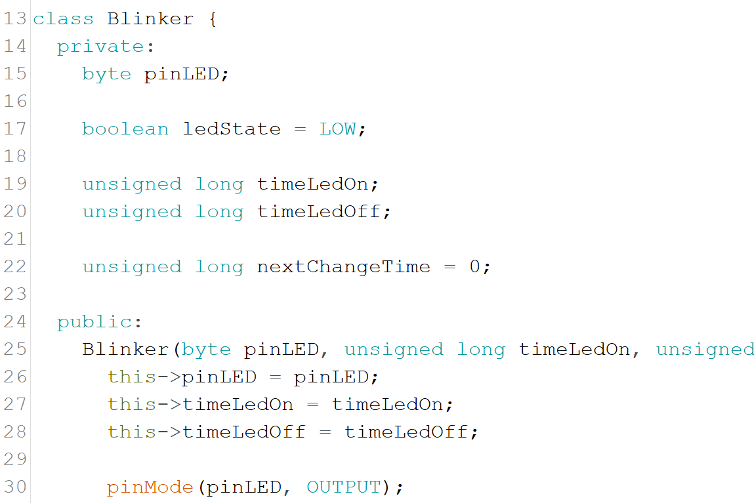 Below is a short Arduino Code with a C++ Class without using a Library. // Checks whether it is time to turn on or off the LED. // LED is currently turned On. Turn Off LED. // LED is currently turned Off. Turn On LED. Okay, I admit that was not very short. At least you can see that I have used a C++ Class without creating a library. You can compile it in your Arduino IDE if you still do not believe me. You can see the Circuit Diagram somewhere below, there is also a Fritzing Diagram if you want to seriously test it.